The Lamptron CR530 fan control makes it easy to control fans installed in a computer. The fans are fully automatically controlled by a temperature sensor. There are a total of five channels each with 30 watts of power available, with four ports for standard fan (3-pin) and a connection for PWM fan (4-pin) or another standard fan are suitable. The CR530 has a temperature sensor and a backlit LC display that provides extensive information on the connected fans. The colors of the LC display can be changed via a DIP switch. 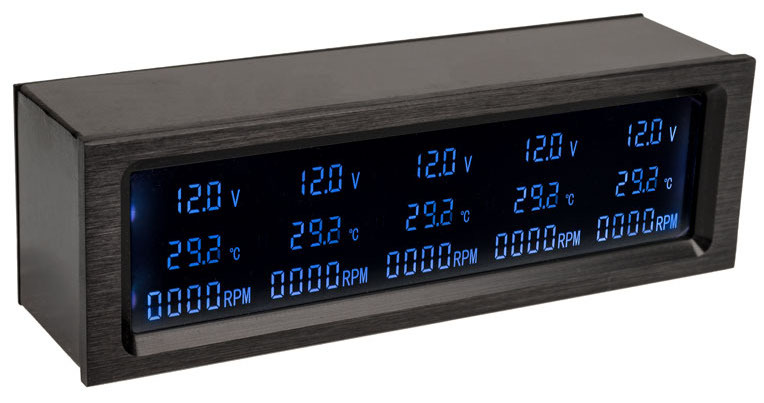 Lamptron's CR530 fan controller adds a practical solution to the regulation of built-in fans. The compact housing captivates with its black optic and surrounds the blue glowing LC display in a perfect way. The control is fully automatic by the controller, which monitors the housing temperature with a sensor. For example, the CR530 can be placed and controlled in a closed 5.25-inch format in a case with a transparent side panel or outside of the case. A total of four standard (3-pin) and one PWM fan (4-pin) can be connected, the latter could also be replaced by a standard fan. In addition to the 4-pin cable and the four 3-pin cables, the scope of supply also includes a temperature sensor. Power is supplied to the fan control via a 4-pin Molex connector, which in turn is not included. Note: Four 4-pin PWM fans can be connected to the four 3-pin connectors instead of standard fans. However, these can only be regulated by the voltage.